Crafted with pride in the USA, this handsome reception area sofa seats three comfortably. Strong and sturdy, it features a solid oak hardwood frame for lasting durability. It takes up less space in your room than individual chairs, and has an amazing total weight capacity of over a half a ton. Sleek and modern, it will definitely give a fashionable update to your space. Pictured in Charcoal Gray fabric. 1 In. thick solid Oak frame. Extra thick seat and back cushions. Tasteful contemporary styling coordinates with any dcor. Minimal assembly required. Built with unique slide brackets, no tools are required. Made in the USA. Complies with California TB 117 fire code. 1-Year limited warranty. Seat: 16.5 in. D x 19.5 in. W x 14.5 in. H. Weight capacity: 400 lbs. per seat. Total height: 19 in.. Add a little variety to your lobby setting with Wooden Mallet's Dakota Wave Valley Series Sofa. Stylish, economical, and comfortable, this sofa is built to last. 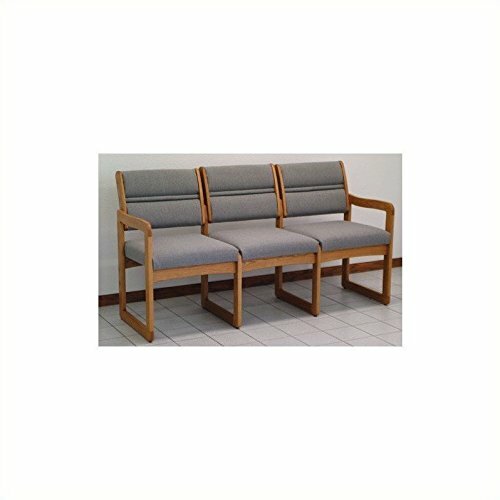 We've combined handsome solid oak with deep, plush upholstery, to create office furniture that presents a warm welcome to your clients and guests. Choose from a variety of wood colors and upholstery options to compliment your dcor or contact us to learn about supplying your own fabric for a custom look. Choose this sofa as part of our complete Dakota Wave collection of coordinating lobby essentials.